Tammy365: Does God Fulfill Our Desires? Does God Fulfill Our Desires? Your relationship with God is yours. You own it. You possess it. You give it energy. Like everything in life, you treasure your relationship or trash it. You nurture and grow it by obeying what his spirit commands you to do. You, my friend, can be as close or far away from God as you want. You can use him as a "Get out of Jail free" card or you can surrender your life into his hands and wholly follow him. I'm opening with this thought to give God all the glory for the 1500 sf gray jewel pictured above, lovingly known as The Holiday House. Lisette gave it the sweet name and "it 'tuck" as Mil says! We enjoyed a glorious Summer 2018 at Mexico Beach. You might ask why I would give God the glory for our beach house? Does God fulfill our desires? I believe he does! 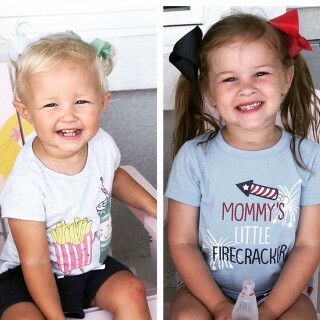 My grands: Milisende and Lisette. My relationship with God began at age 19 when I asked Jesus to be my Savior. I surrendered my life to him somewhere around the age of 35. Saved, I felt free. Surrendered, I feel empowered. Empowered means to give someone the authority or power to do something. 2 Timothy 1:7 says "For God hath not given us the spirit of fear; but of power, and of love, and of a sound mind." Empowered also means to unshackle, liberate, set free; make stronger and more confident, especially in controlling their life and claiming their rights. My God certainly empowers me! But does God fulfill our desires? Many people will say God will not empower you to build a beach house. They just won't believe it. Oh, but he will and here's why. Psalm 37:4 is one of my favorite verses in the Bible and it goes like this; Delight thyself also in the Lord: and he shall give thee the desires of thine heart. Now you're getting excited because you want some things too, right? Have you ever considered that scripture and asked yourself "Does God fulfill our desires?". I DIDN'T desire a beach house. Let me say that again. I didn't desire a beach house. Building that house is one of the scariest things I've done in my life, trusting God fully. I'm not talking about prosperity gospel here. My household of two people living on disability incomes went from zero debt to the largest debt responsibility we have ever carried! Let that sink in also. 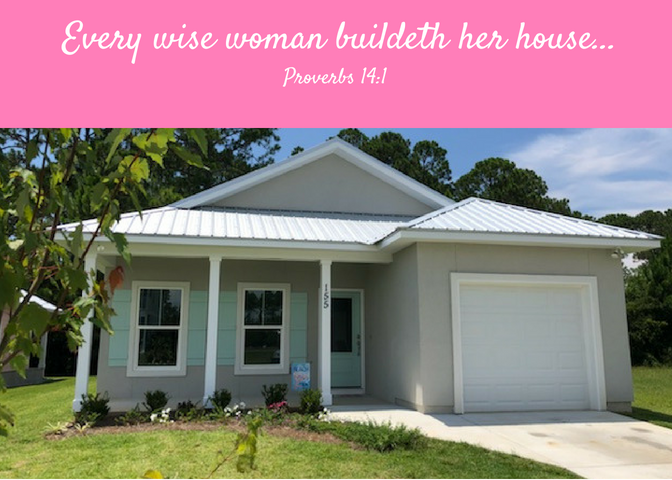 My husband and I were debt-free when we accepted the challenge God laid before us to build this house. I, personally, would be scared to death if I didn't have the power of God making me stronger. The Lung Institute has a great article about The Health Benefits of Ocean Air. You see, I didn't desire a beach house. My toes, real or silicone, have never been stuck in the sand. The desire of my heart is to spend as much quality time as God will allow with my husband who has a serious lung disease. When Steve was diagnosed in 2012, we spent a month at the beach upon God's direction. We saw improvement in his lungs. I've been wrestling with building this God-ordained house for five years. The house is unimportant. God orchestrating our lives is priceless. I have no idea how this house will fully play into giving me my hearts desire to spend as much quality time with my husband as possible. I do know God fulfills our desires and this beach house is part of his answer to fulfill mine. I wanted to build in our subdivision the first time I laid eyes on it. Steve did not. How can you go wrong with an address of Ocean Plantation Circle? We ended up buying a lot in Port St. Joe instead of Mexico Beach. I could not get comfortable with the lot. Everything about it was annoying, although it was .08 of a mile closer to the beach than the lot we built on. The HOA was pushy. The neighbors were rude and pushy. Yep, they bombarded us every time we simply walked onto the property. One lady, behind us in a different subdivision, sent us a letter stating we had a tree on our lot that was "leaning" toward her house and she'd appreciate it if we removed it. We removed the tiny sapling. This particular subdivision allowed weekly or monthly rentals until we submitted our house plans to the HOA whereupon they called a "special" meeting to deny all short-term rentals. Geez!!! Does God fulfill our desires? Not with an unreasonable HOA! We left that meeting and listed our lot. The lot sold profitable in two short months. 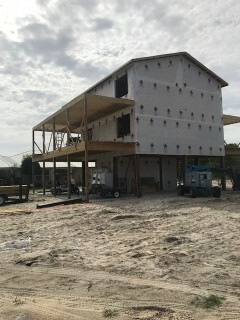 Now this monster is being built directly in front of that lot we sold in Port St. Joe. Our planned 1200 sf tiny home would have de-valued immediately in its shadow. God always knows best! Last piece of God's orchestrated plan for our beach house. After selling the lot, we traveled back to Mexico Beach to look again. We rode all those small streets with a vengeance searching for our lot. I asked Steve to go back to Ocean Plantation to look one more time because that subdivision was my heart's desire. We were so disappointed and maybe a little devastated when no lots were for sell. I called Sally, our real estate professional. Sally was such a saint dealing with all my questions and indecisiveness for five years! This time, persistence paid off. Sally told us zero lots were available in OP. However, she knew a gentleman from New Jersey that might sell his. Our little piece of heaven sits on that lot. And I'll add, there are four lots for sale in OP now at 40%-50% higher than what we paid. God takes care of us in so many ways.....IF we surrender our life to his plan. I can hardly wait to share all the ways God will use his beach house! Sending you love & 🤗 hugs, Tammy!